gardening with dogs, is it possible? I thought it was. I mean, for a long time things were going great. I planted things, half of them died, but the rest grew up unmolested by poodles. Then one day the poodles began to dig. Never in the same place. They dug up some of the new foxgloves I put in along the back fence. They dug up the lupins. They dug up the catmint and new columbines. They dug and broke low branches off the crepe myrtle. They dug and broke the hardenbergia in half. They dug and knocked out the pigface I’d dared to survive in the cement-like, inhospitable slope. They dug small channels under fences. …I tried to stop it. I put up fences. I used dog pens and stakes and zip ties. They knocked them down and moved them. I put them up again. They found another spot to dig. 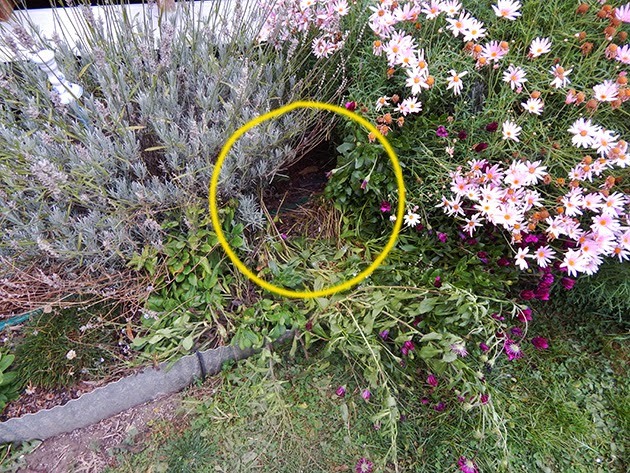 Flattened osteospermums and a hole between the english lavender and the pink daisies. 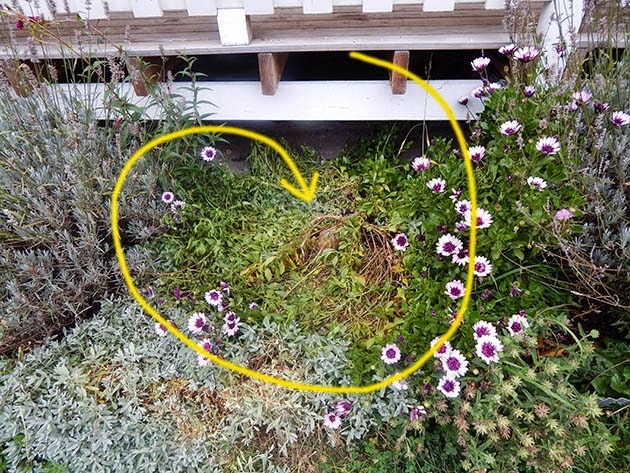 Broken and flattened double osteospermums – looks like someone decided so take a nap there. Thankfully the young penstemon on the left avoided annihilation. 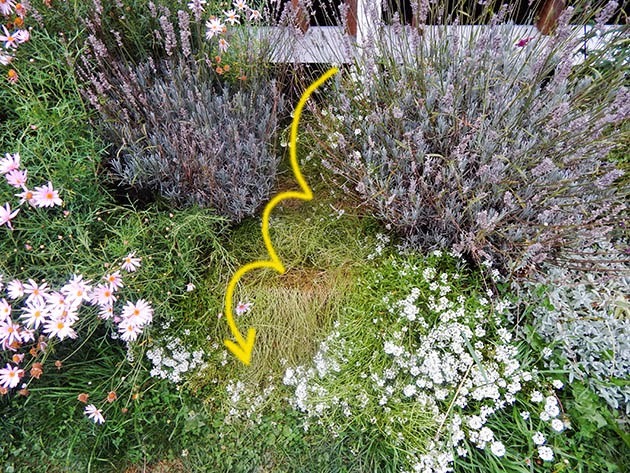 The alyssum wasn’t so lucky. It looks like this was another nice spot to rest. Ok. I’m not overly worried about the alyssum. That stuff is growing in cracks in the path. The snow in summer is looking scraggly but that should be ok. And the osteospermums should bounce back. I’ll just give them a trim, I have to do for winter anyway. Its that I plan to replant the old garden beds in front of the casita with new plants. Last weekend I got my garden helper to remove all the too-large plants from the beds, dig up and mix in new soil in preparation of planting all sorts of smaller flowering plants: mixed bulbs, columbines, whatever strikes my fancy. The dogs have been leaving footprints all over the narrow beds, which I could cope with. But they’re also digging it up. I’m really beginning to get annoyed here. I get that they dig after critters in the yard. Rats probably, around the foundations of the casita. The odd native animal. Whatever. But digging in a new bed? There are no critters in there! They’re just loving digging! I’ve never had diggers before and I’m stumped. I plan to put a fence over the new beds but that won’t guarantee anything. I think I may go back to toy poodles. At least they can’t dig up a whole tree. This entry was posted in Dogs, garden by zefiart. Bookmark the permalink. At least a toy poodle can't dig up a whole tree…IN ONE DAY!!! Oh, gosh. That's discouraging. I don't understand what it might be that standard poodles need to keep them busy – and not near the garden! Maybe you'll figure something out.